Maryland Sea Grant has funded scientific research relevant to the Chesapeake Bay and the Maryland residents who conserve, enjoy, and make their living from it. The funded projects advance scientific knowledge through the publication of peer-reviewed journal articles. You may search these publications by keyword and year of publication. Publications prior to 2003 can be accessed through the National Sea Grant Library. Bruhn, JB; Gram, L; Belas, R. 2007. Production of antibacterial compounds and biofilm formation by Roseobacter species are influenced by culture conditions. Applied and Environmental Microbiology 73(2):442-450. doi:10.1128/AEM.02238-06. UM-SG-RS-2007-01. Bullard, SG; Lambert, G; Carman, MR; Byrnes, J; Whitlatch, RB; Ruiz, G; Miller, RJ; Harris, L; Valentine, PC; Collie, JS; Pederson, J; McNaught, DC; Cohen, AN; Asch, RG; Dijkstra, J; Heinonen, K. 2007. The colonial ascidian Didemnum sp A: Current distribution, basic biology and potential threat to marine communities of the northeast and west coasts of North America. Journal of Experimental Marine Biology and Ecology 342(1):99-108. doi:10.1016/j.jembe.2006.10.020. UM-SG-RS-2007-04. Chen, SN; Sanford, LP; Koch, EW; Shi, F; North, EW. 2007. A nearshore model to investigate the effects of seagrass bed geometry on wave attenuation and suspended sediment transport. Estuaries and Coasts 30(2):296-310. doi:10.1007/BF02700172. UM-SG-RS-2007-06. deRivera, CE; Hitchcock, NG; Teck, SJ; Steves, BP; Hines, AH; Ruiz, GM. 2007. Larval development rate predicts range expansion of an introduced crab. Marine Biology 150(6):1275-1288. doi:10.1007/s00227-006-0451-9. UM-SG-RS-2007-07. Drake, LA; Doblin, MA; Dobbs, FC. 2007. Potential microbial bioinvasions via ships' ballast water, sediment, and biofilm. Marine Pollution Bulletin 55:333-341. doi:10.1016/j.marpolbul.2006.11.007. UM-SG-RS-2007-29. Dungan, CF; Reece, KS; Hamilton, RM; Stokes, NA; Burreson, EM. 2007. Experimental cross-infections by Perkinsus marinus and P. chesapeaki in three sympatric species of Chesapeake Bay oysters and clams. Diseases of Aquatic Organisms 76(1):67-75. doi:10.3354/dao076067. UM-SG-RS-2007-21. Glibert, PM; Wazniak, CE; Hall, MR; Sturgis, B. 2007. Seasonal and interannual trends in nitrogen and brown tide in Maryland's coastal bays. Ecological Applications 17(5):79-87. doi:10.1890/05-1614.1. UM-SG-RS-2007-11. McCann, LD; Hitchcock, NG; Winston, JE; Ruiz, GM. 2007. Non-native bryozoans in coastal embayments of the Southern United States: New records for the western Atlantic. Bulletin of Marine Science 80(2):319-342. UM-SG-RS-2007-19. McCollough, CB; Albright, BW; Abbe, GR; Barker, LS; Dungan, CF. 2007. Acquisition and progression of Perkinsus marinas infections by specific-pathogen-free juvenile oysters (Crassostrea virginica Gmelin) in a mesohaline Chesapeake Bay tributary. Journal of Shellfish Research 26(2):465-477. doi:10.2983/0730-8000(2007)26[465:AAPOPM]2.0.CO;2. UM-SG-RS-2007-14. Miller, WD; Harding, LW. 2007. Climate forcing of the spring bloom in Chesapeake Bay. Marine Ecology Progress Series 331:11-22. doi:10.3354/meps331011. UM-SG-RS-2007-08. Newell, RIE. 2007. A framework for developing "ecological carrying capacity" mathematical models for bivalve mollusc aquaculture. Bulletin of Fisheries Research Agency 19:41-51. UM-SG-RS-2007-18. Newell, RIE; Kemp, WM; Hagy, JD; Cerco, CF; Testa, JM; Boynton, WR. 2007. Top-down control of phytoplankton by oysters in Chesapeake Bay, USA: Comment on Pomeroy et al. (2006). Marine Ecology Progress Series 341:293-298. doi:10.3354/meps341293. UM-SG-RS-2007-16. Newell, RIE; Kennedy, VS; Shaw, KS. 2007. Comparative vulnerability to predators, and induced defense responses, of eastern oysters Crassostrea virginica and non-native Crassostrea ariakensis oysters in Chesapeake Bay. Marine Biology 152(2):449-460. doi:10.1007/s00227-007-0706-0. UM-SG-RS-2007-09. Nye, JA; Davis, DD; Miller, TJ. 2007. The effect of maternal exposure to contaminated sediment on the growth and condition of larval Fundulus heteroclitus. Aquatic Toxicology 82(4):242-250. doi:10.1016/j.aquatox.2007.02.011. UM-SG-RS-2007-17. Osman, RW; Whitlatch, RB. 2007. Variation in the ability of Didemnum sp to invade established communities. Journal of Experimental Marine Biology and Ecology 342(1):40-53. doi:10.1016/j.jembe.2006.10.013. UM-SG-RS-2007-05. Paolisso, M. 2007. Cultural models and cultural consensus of Chesapeake Bay blue crab and oyster fisheries. NAPA Bulletin 28(1):123-135. doi:10.1525/napa.2007.28.1.123. UM-SG-RS-2007-27. Paolisso, M. 2007. 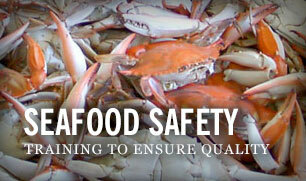 Taste the traditions: Crabs, crab cakes, and the Chesapeake Bay blue crab fishery. American Anthropologist 109(4):654-665. doi:10.1525/AA.2007.109.4.654. UM-SG-RS-2007-15. Power, LP; Paolisso, M. 2007. Linking estuarine research to local community heritage & environmental values: lessons from the Chesapeake Bay. Practicing Anthropology 29(1):29-34. UM-SG-RS-2007-20. Tilley, DR; Ahmed, M; Son, JH; Badrinarayanan, H. 2007. Hyperspectral reflectance response of freshwater macrophytes to salinity in a brackish subtropical marsh. Journal of Environmental Quality 36(3):780-789. doi:10.2134/jeq2005.0327. UM-SG-RS-2007-10. Webster, D. 2007. Transporting live fish. Timmons, MB; Ebeling, JB, eds. Recirculating Aquaculture. Northeastern Regional Aquaculture Center. Chapter 15:573-595. UM-SG-RS-2007-28.